Seeing and not seeing, that is the contrast that is central to New Eyes by young Dutch artist Margje Schuurman (b. 1988). 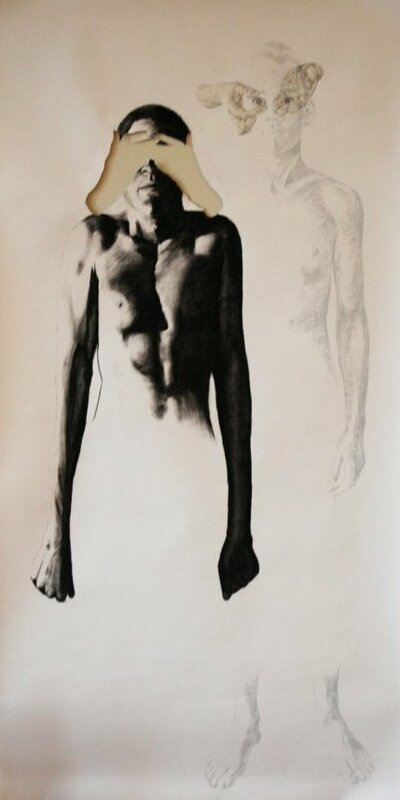 In the drawing we see two figures that differ from each other as day and night. The figure in the foreground is characterized by strong dark shadows and a body full of tension. Everything about him radiates anxiety, even the muscles of his face are tense. Also we do not see his eyes. There is literally a void there as the paper has been cut away in the shape of two hands covering his eyes and depriving him of sight. The figure is full of fear. He appears immobilized and locked up in himself. Behind him stands a second figure that too is portrayed only in part. He contrasts strongly with the dark figure. Due to soft lines and shadows light seems to radiate from him. This man stands up straight, but his muscles are not pulled tightly. His hand and shoulder hang down loosely. He emanates peace and confidence. Because of the light tones this second man threatens to fade into insignificance compared to the dark figure in the foreground. However, his large clear eyes which look out at us prevent this from happening. Also here we see two hands engaged with the eyes of the man, but here the opposite is happening. Hands are giving sight rather than taking it away. Who are these figures? Or is it one and the same person in two situations? When we look at the right hand of the dark figure, Margje Schuurman seems to give us a clue. In the middle of his hand we see a dark spot reminding us of the stigmata of Jesus. It could be Jesus in his time of suffering, in mortal fear and eventually entering the darkest darkness of death. The only thing he could still notice was a desolate void, no longer capable of seeing God (Matthew 27:46). Schuurman shows, however, that this was not the end. In the second figure she seems to tell the rest of the story. The man, Jesus, rose from the dead. He started to pulse with life again and his sight of God’s presence was restored. Whether this man is Jesus, the artist leaves to our own interpretation. By suggesting one of the stigmata she seems to point to Jesus, but that is not the only possibility. After all, we do not see any wounds in the feet of the second figure and also the mark on his hand is open to discussion. The story of the New Eyes can also relate to us personally, as sometimes our life is dark and we lose sight of God. We are full of fear, groping about in the dark, afraid to take another step, unable to discern how to move forward. New Eyes makes clear that there is a way out. Someone can revive our sight and renew our vision of life. In Luke 24:30 and 31 we read how Jesus does this for two of his disciples. They are overcome by grief, as Jesus has died and they are not aware that he is risen. But then Jesus opens their eyes. ‘When he was at the table with them, he took bread, blessed and broke it, and gave it to them. Then their eyes were opened, and they recognized him.’ Margje Schuurman helps us see that Jesus can free us from our darkness and once again restore our vision of himself and of life. 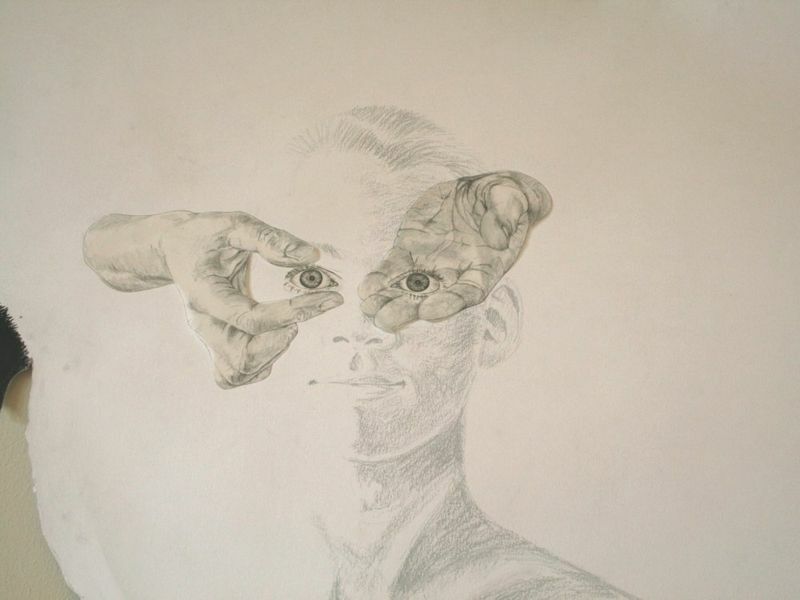 Margje Schuurman: New Eyes, 2009, 210 x 90 cm, pencil and paper. Nina Minnaar (b. 1991) is near to completing her MA in art history at the Radboud University Nijmegen, the Netherlands. She has specialized in modern and contemporary art, while also looking for traces of Christianity in these areas. At this moment she is doing research as an ArtWay intern into young Christian artists in the Netherlands. In the summer of 2013 she hopes to graduate and find a suitable job.